Usually, Asus can do no wrong in our book – so often are its motherboards top-notch, ultra-reliable slabs of silicon. But, with the Rampage II Gene, it seems Asus has earned a black mark. You see, the Rampage II Gene is a micro-ATX mobo, which you'd only really need with a micro-ATX case. If you're spending £215 on a mobo and a further £215 on a Core i7 processor, you'll need a top end graphics card to get the most out of its gaming prowess. But that means a large, small form factor gaming chassis, and there's not too many of them. In terms of performance and price, it's not bad and Asus has added a few decent features. For example, there's a simple overclocking feature, in which you specify what you want and the motherboard takes care of the rest. No more fiddling with clocks and multipliers. Yet Asus has also cut back on features too. You'll only find two graphics cards slots, as opposed to the X58 standard of triple PCI-E. Being dinkier than its full-size brethren, you also won't have the space to fill those standard PCI slots with aging gizmos. By Christmas, when I expect small form factor graphics cards from major manufacturers and a lower price tag for the board itself, this would get a four-and-a-half star score. 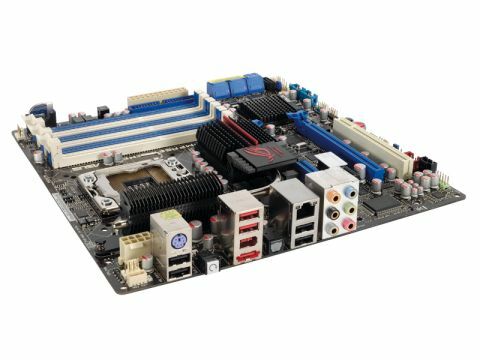 As the market currently stands, it's a slightly redundant mobo.